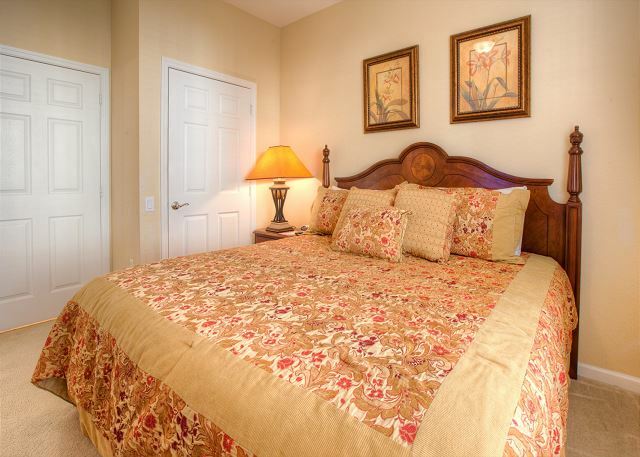 If your dream Florida vacation involves peace and quiet, then Dream Getaway is the perfect condo for you. Grab your beach books and cuddle up on the plush furnishings or out on the sunny patio and enjoy the peace and quiet this first-floor vacation condo has to offer. It's modern decor and thoroughly equipped kitchen provide all the comforts of home, without feeling like you have to take care of all the details. The master bedroom offers a comfortable king bed and LCD TV, perfect for de-stressing, and the second bedroom also has a large king bed. The sleeper sofa in the living room holds a queen bed as well, ensuring there is plenty of room for everyone, including Fido! This condo is pet-friendly and comfortable for your furry friends because of it's first-floor location. 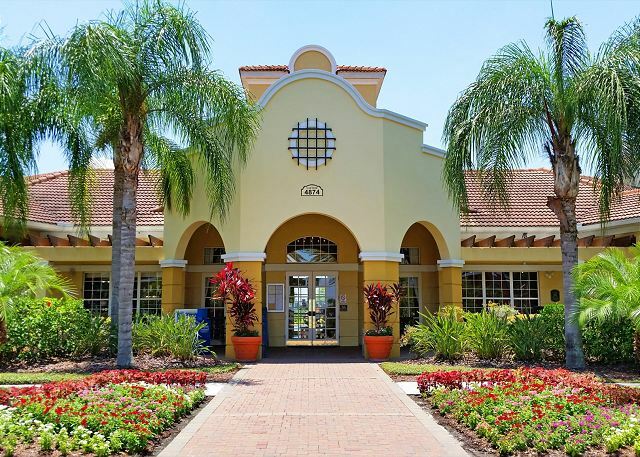 The property is right next door to the Orange County Convention Center, and less than 10 minutes away from all major theme parks, including SeaWorld, Universal Studios and Walt Disney World. "It's a huge facility, but still remains nice, quiet and safe. Great amenities. Pool with poolside bar was a fun place to hang out. The gym was well equipped. We had a very enjoyable and relaxing stay. The carpet was a bit soiled in spots, but forgivable since it's overall a nice place for being so pet friendly. Only real issue was with the vertical blinds missing a couple panels, so it hindered privacy in the livingroom area. Universal, Disney, golf and shopping are all close by." "The room was clean and nicely situated. True to the picture displayed. " "Buena experiencia, departamento cómodo y limpio, cabe mencionar detalles como ducha de baño con apariencia sucia, extractor de olores de la cocina no funcionaba y le faltaban los filtros, dispensado de agua del refrigerador con hongos, estos dos últimas anomalías no fueron utilizadas por nosotros, pero puede servir para otros huéspedes y tambienn mejorar los olores del departamento, olor a humedad." "I absolutely can not fault Casiola they have been so helpful, friendly and accommodating and the properties were beautiful, very clean and comfortable. 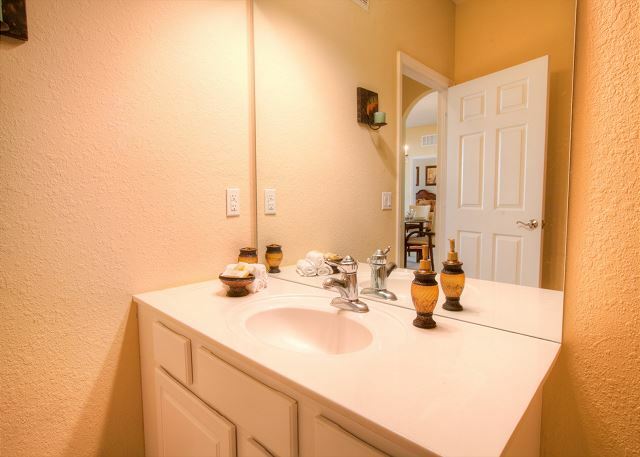 Just excellent, I've been visiting Orlando for 20 years and this property company is by far the best I've used." "The place is perfectly located if youre visiting the theme parks." "Vista Cay was the perfect place to stay for a mix of work and play. 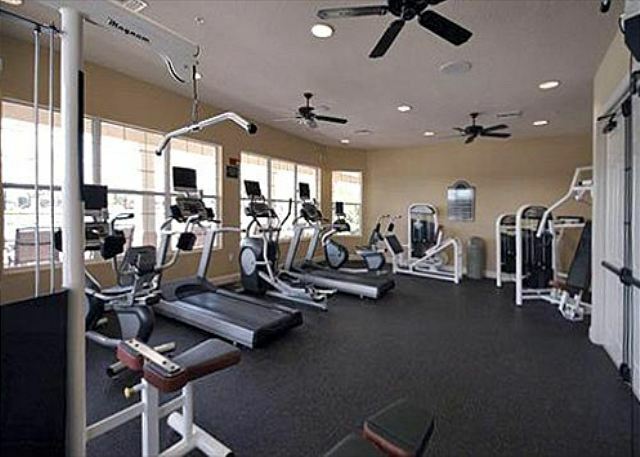 Walking distance to OCCC, a great pool, hot tub, bar area, plus all the comforts of home in the condo. Very comfortable beds. Cheap and worn furniture but overall clean." "Got to Orlando early and got early check in, which is great being we have dogs with. Grocery shopping is so easy, and also that strip has several good eating places. The grounds are very nice. This unit is nice but is needing steam cleaning for carpet or new carpet, and repainting. All in all very good. " 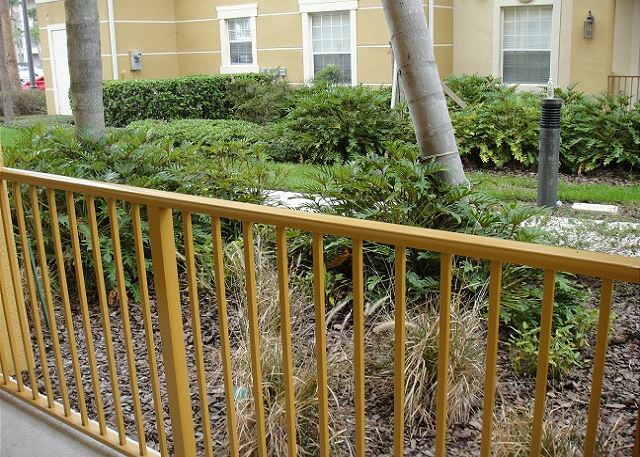 "The location is very ideal as it is very near to major theme parks. The facility is also very friendly to family with kids. All of my families enjoyed staying there and had a good time. " "Comfortable place, I felt at home." "I had to go to Orlando for a few days of business and decided to take a few extra days for vacation and bring the family. It was a very relaxing time, and we enjoyed the pool very much. My son and his family took advantage of the proximity to Universal Studios and Seaworld." "Excelent location,rooms confortable,giant bathrooms,excellent kitchen,big parking. Was amazing." "Place was clean huge rooms good close to parks and night life "
"Awesome stay in Casiola, room was clean, facilities are great. great place for family traveling. " "The condo was everything we needed and more. Plenty off space for a family of four. It was clean and quiet. My family will never stay st a hotel again without first considering casiola." "Me and my guest arrived early to the property. Once we got into the room we could see that it was well maintained and very spacious. The kitchen was fully stocked. Even with it's location being 4 miles away from Universal Orlando the entire area was quiet. The property is located close to both a Walgreens and a Publix. Like I mentioned earlier the property is 4 miles away from Universal Orlando. The property is also close to the Orlando Eye. I would recommend this property to anyone looking for a bit of R & R at an affordable price." 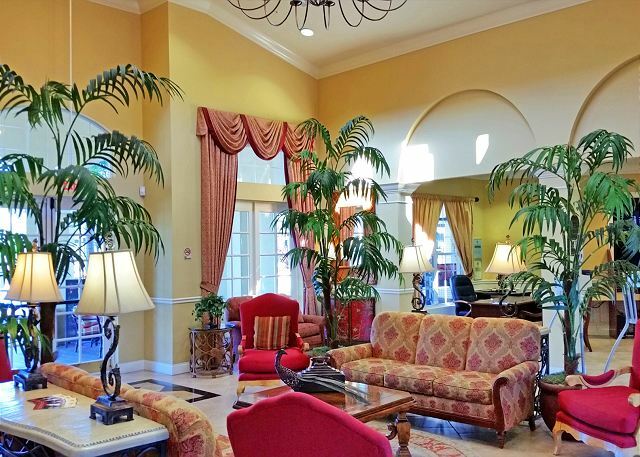 "I would highly recommend this place to families who are in Orlando for an extended stay. Room to spread out and escape the crowds for a bit. Very convenient to Universal and Sea World. Just watch out for that glass coffee table or you'll take home a new bruise or two." "Excelent concept!! Great appartment. Space is great, ammenities and everything. great location. And best of all, organization: couple a weeks before my departure, I've received an email with everything I need to acces my appartment"
and less than two rooms at the hotels." "nice place to stay with our dog. it had a febreeze smell that i am not fond of. wish it had tile or wood instead of carpet to maybe fix that. great location and great deal. " "Great location. Very close to all the theme parks. Quiet neighborhood. Overall positive experience. In regards to maintenance of condo, I would recommend a slight upgrade to the floors and replace dining room chairs. 3 out of the 4 chairs were very stained and wobbly. Aside from that, I would rent again at Vista Cay." "Condo was just what I needed. got early check in all good. " "Very space apartments with perfect location. We had a great time there and were sad while leaving after 5 days"
"We stayed here during the hurricane and it was well worth the money we paid. Very spacious and clean. Was a life saver with animals. Would definitely recommend staying here. Management even let us check in early." "We were very happy with our rental. The beds were comfortable, the location was perfect and it was very quiet. It also has a wonderful 2 mile running path around the lake." "Vacation home was lovely however a diamond engagement ring was stolen from the apartment while we were out during the day. This made us feel very uncomfortable and unsafe. The apartment had a coded door and we felt anyone that knew the code could just walk in. Cassiola said no members of staff had been near the apartment but how could they tell? Anyone could enter the has he codes. " Manager Response: Dear Chloe, Thank you so much for your review and I'm so sorry to see that you lost your engagement ring. All our vacation homes have a commercial grade electronic lock with a personal and time sensitive door code. The door code that you received was only send to you and only valid during the days of your stay. No one else received your door code and the codes from previous guests don't work because they are all time sensitive. Each staff member also has their own personal door code and each lock is connected and has a log so we can see exactly who went in and at what day and time. I hope that you just misplaced your ring and that it will still turn up when you get back home. "The condo was perfect for my family. We were close to shopping and just a few minutes to the Disney Resorts that made the commute pleasant. The beds were comfortable, the condo was very clean, and having access to the pool and workout facility was an added bonus. Will definitely stay here again. " "Just what we needed for our family of four. comfortable and equipped. It would have been nice to have a bit more natural light, as it was quite dark facing other apartments but we spent most of our time outside anyway. The only challenge we had was finding it in the first place as the sat nav didn't take us to the right block, and it was dark - so some written directions would be great. The gym was small but served a purpose, and a couple of laps of the lake at sunrise was stunning. " 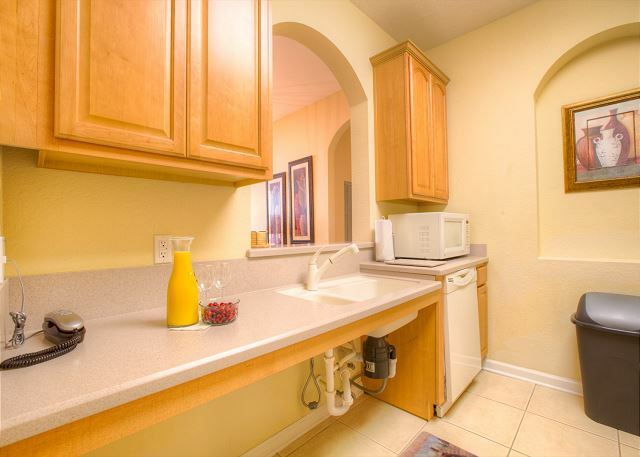 "Very nice place &comfortabal special location to Disneyland"
"We stayed for 1 week. Everything was great, very clean. I love that everything we needed was there, and stores were right around the corner." 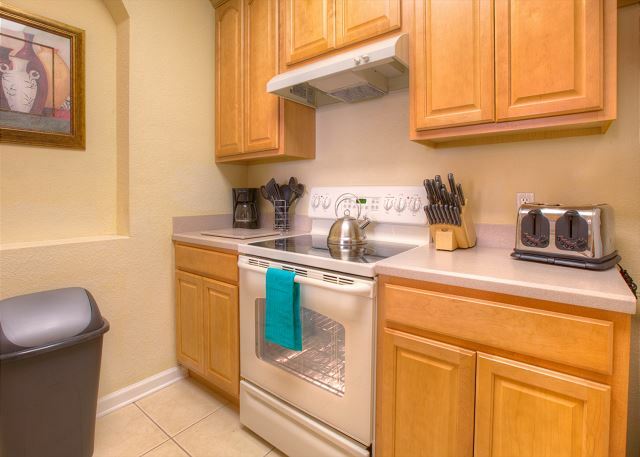 "I loved the location of this rental, minutes from I-drive, but in a secluded area, quite, very close to publix, 20 mins to Disney. Complex amenities (pool, hot tub, gym) were all great. The walking path along the lake was nice. They take pets, which was perfect for us. I enjoyed the first floor location for easy access. 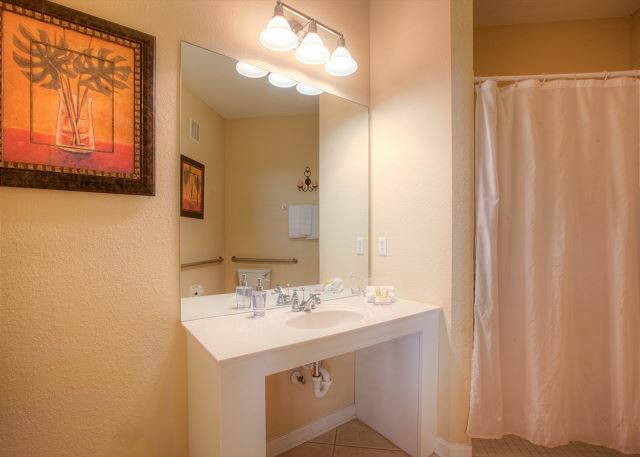 The unit was very clean, my favorite thing was the beds, large and very comfortable! 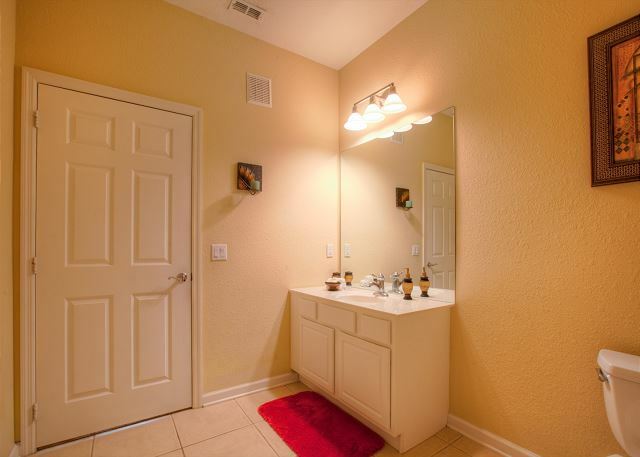 The bathrooms are nice sized, living area is tight but functional. Patio is just large enough to sit out and enjoy a cup of coffee. Unit has towels, pool towels, and basic kitchen essentials (coffee pot, blender, microwave, toaster), just enough plates and silverware, cook ware ect. I thought it was a little light on cooking items compared to others I have stayed in, there was 3 wine openers though, lol. I liked that it was a quiet, I couldn't hear other renters (or their dogs). We added a day at the end of our trip, done by email, all went smoothly." "Been staying at Vista Cay for 5 years. This is first time in a 1st floor 2 br 2 ba. The unit was nice, bathrooms clean, bedding nice. Only thing I can say that the carpet in main walk way was dirty.... and too big of coffee table for a small room. Patio nice.... kitchen great. A lot a note, I have bought 6 more people to stay at Vista Cay. "Tudo muito organizado e funcional mas para mim e minha família o ambiente estava muito escuro. Não gostei também das baratas (cockroaches). Todos os dias tínhamos que matar uma barata nova. Além de duas pequeninas rãs que foram nos visitar. Não gostei do carpete, dá impressão de sujeira, prefiro piso frio. O prédio que ficamos ficava longe do lago. Não tivemos muita sorte neste sentido. No mais, o que mais gostei foi o espaço e oferecia tudo que precisávamos para o dia a dia." "El lugar limpio, en condiciones, seguro yc on todas las prestaciones contratadas"
To magic kingdom an universal studio!!!" "Very nice experience , I will come again." "Our experience was just as last year that we enjoyed our stay. Your home don't give you reason to leave and go for shopping or something else. We enjoy to the fullest. The only minor experience were the cockroaches we saw. There was no mobile phone coverage when we were in the building. But the internet was okay. "It was a home away from home. The location was great for access to the convention center and the supermarket was right next door. The apartment was clean with a homely feel. Will be staying there again so will my guests with their family. Enjoyed my stay." 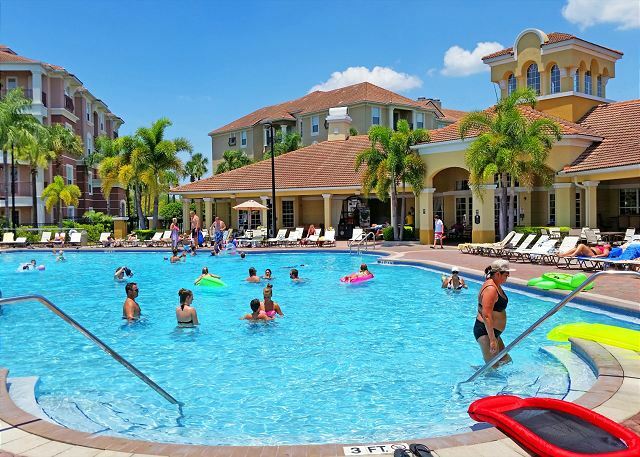 "Me and my family spent 10 days at Vista Cay. The acomodations is really outstanding. The kitchen is abslutely complete, the rooms are huge and the space outdoor is wonderfull. Perfect for children and family." "Our stay was nice but I was not as pleased with the u unit as I have been in the past. The security latch on the door was broken, carpet was dirty, couches was old and stained, and there was a old wet smelling scent in the master bedroom section. However I do know that there are better units that my family really enjoyed." "Great place ... Spacious ... Convenient ... Would be my 1st choice if/when I come back to Orlando"
"we enjoyed stay for the whole family and had fun. " "I have found the group that I will book my vacations to Orlando again. Upon first arrival, there was a small problem. Being Sunday night, I figured I would have to wait till the next day to have this fixed. Much to my surprise, the manager called me at 10:30 that night to take care of the problem. I stayed for 2 weeks and had the best time. The unit was clean and comfortable. The management company was super to deal with. This unit rents to pet owners. You can not tell that other pets have been here. No animal smell at all. Would stay again."